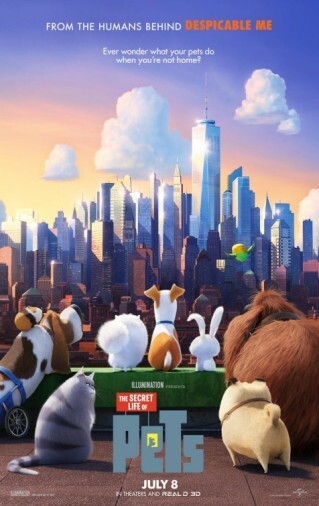 Universal Pictures releases The Secret Life of Pets nationwide on July 8th, 2016. NYC MOVIE GURU: What appeals to you about the character of Max that you play? How do you relate to Max? Louis C.K. : This role always made sense to me which is why I decided to do it. Max is a dog who lives in New York City, and I also live in New York. You have this tension with your little hom because everyone’s apartment is small and intimate in the chaos of the giant city. So, I always understood Max in that way. Dogs are very transparent and easy to read. I understand every time Max is desperate for the woman to come home. But when you play another species, you can more easily get rid of parts of yourself. Dogs don’t have any timelines in their head, so they don’t have any confidence in the future. So, they think that whatever they’re feeling now is what they’re always going to feel. They're also domestic creatures, so they’re really dependent on people, and really need someone to feel okay. You can give a dog all his toys and treats, but he’s not happy unless his owner’s there, too. NYC MOVIE GURU: Lake, what about you? Lake Bell: I play a cat, and I don’t know many cats, personally. I don’t have many dear friends who are cats. But in playing this cat, I have learned a lot about the cat community. I discovered that their complexity makes them great. I have been campaigning so hard to get a cat to my husband because they’re so cute. But he’s officially a dog dude. NYC MOVIE GURU: And how do you relate to Chloe? Lake Bell: I’m more of an optimistic person, and Chloe’s the antithesis of that: she’s a pessimist at all odds. But she enjoys eating, which is something that I enjoy a lot! NYC MOVIE GURU: How is your acting process in an animated film different from your acting process in live action? Lake Bell: When you’re doing animated films, you don’t put on a cloak of understanding for your characters. The process is a little more lax and a lot more fun. There isn’t any pressure to delve into your soul; you just bring yourself, but I also enjoyed Chloe's sarcasm. It’s a very fun and different exercise for an actor to not have to go through hair and make-up, and not be conscious of what they’re doing in front of the camera. You’re free to make strange faces, which do add to your voice performance. NYC MOVIE GURU: Bobby, how did you end up voicing Mel? How do you relate to Mel? Bobby Moynihan: Whoever decided that I should audition for this thought I kind of looks like him a little bit. I also think I’m a hyper-energetic person sometimes and that comes across on screen. I know that I had to be this highly energetic dog, so a lot of my preparation involved coffee. I’m not a coffee drinker, so I would just have a cup of coffee before my recording sessions. That would last for my two-hour screaming sessions as I recorded everyday. But then I would be very tired as I walked home. NYC MOVIE GURU: Have you ever had a dog? Bobby Moynihan: I never had a dog, but since appearing in this movie, I have Googled pugs, because I want to find one that looks like my character. I would like to own that dog, and name it Mel. But I probably won’t ever own a dog because I can’t even take care of myself. NYC MOVIE GURU: Eric, how do you relate to Cam? Eric Stronestreet: Cam is a type of character I have never played before appearing on the show, but I always want to play different careers in my career, and the show is the reason why you know who I am. So the fact that Duke is different from Cam isn’t a big deal to me-he’s just a different character I get to play. He’s hiding something because he’s scared and nervous. I think we all do that, because we want to protect ourselves in some ways. In this opportunity, Duke has the chance to live in a great new house. He doesn’t know how to make that stick, so he uses his size to boss his way in. I’ve probably been guilty of that in my life-I can use my physicality to get my way every once in awhile. So obviously I relate to that. He’s also a fun and loveable guy, and I think I’m like that, too. Duke is a dog for open space. All dogs need homes. I think it’s cute that they matched Max and Duke up. You don’t know where friendship is going to come from, and you can’t know for sure who you’re going to find a friend in. I like that there was a Laurel and Hardy aspect to Max and Duke. NYC MOVIE GURU: How is your approach to the material in an animated film different than your apprach in an live action film? Eric Stonestreet: It’s the same thing I do with the show. I look at the material that I have to do, so that I know the objective of the scene, just from an acting standpoint. I know what Duke wants, just like I want to know what Cam wants when I’m going to shoot Modern Family. I say the lines as many different ways as I can. I find different intentions and ways to deliver the lines, so that when the editors smash it together, they have options. I try to challenge myself, and come up with different ways to say my lines.I’m not worried about having people watch me make myself look really bad. At least there’s only like four people there to watch me fall flat on my face if it doesn’t work. You have a crew of so many people, so if you do a bad take, it’s like, "Wow! How’d this guy get a job? He’s terrible." In animation, you have the freedom to be exploratory, and have fun with it. It’s exhilarating and super fun, and I could do it all day. NYC MOVIE GURU: Do you have any pets? Eric Stonestreet: I grew up with pigs, cows, cats and dogs, in Kansas. I had animals to feed, basically since the third grade on. That taught me, at a very young age, that the world exists outside of the three foot perimeter around me. Gaining that reverence and respect for animals was a great lesson for me to learn young. NYC MOVIE GURU: How did you end up cast as Snowball? Kevin Hart: They showed me a picture of the bunny, where he was very nice and adorable. Then they flipped the page, and he was grabbing his ears, and his eyes were angry,” Hart explained. “They said, "Kevin, we want you to bring your personality to this bunny. Bring your cute and cuddly side, but at the same time, make it believable that he can start a revolution, and have other animals follow him." So, I jumped at the opportunity. This is my first animated film, and nothing gets you more excited for it than seeing that your character has two sides. NYC MOVIE GURU: How were you able to relate to Snowball? Kevin Hart: Snowball is very insecure. While he’s the leader, there is a strong sense of doubt in everything he does. With every order he gives, there’s a question behind it; he asks, ‘Was that too much? Do you guys get that?’ That’s something that Chris and I spoke about, because we wanted to ground the character. If the bunny only has one note, he wouldn’t be fun to track. NYC MOVIE GURU: Bobby, if your pet were to suddenly by able to talk, what would you say to it? Bobby Moynihan: "If I tell one person you talk, they’ll come take you away and do experiments." I would also ask what people have been saying about me. I would take him to SNL, ask why my sketch got cut, leave the room, and then send my dog in to find out why. Lake Bell: I would start off by telling them, "Listen, I’m not going to tell anyone about this. I’m not going to the media or the government. We’re not going to go on talk shows." So, I would make sure that it would stay a serious secret between the two of us.